Automatically inventory all of your content and map each asset by persona, journey stage, and more. Akoonu, Inc.™, a strategic marketing platform for account-based marketing and selling, today announced the expansion of its integration capabilities and Content Planning module. Akoonu’s expanded MA and CRM integrations and new content inventory and mapping features, coupled with its existing capabilities for buyer-centric marketing, empower B2B marketers to understand, attract, and engage all the people involved in making a buying decision in an account so they can effectively execute their ABM strategy. Akoonu will showcase these new platform capabilities at the SiriusDecisions Summit in Nashville, May 24-27, at booth #646. Akoonu’s configurable frameworks, data and systems integrations, workflows, and collaboration features enable B2B marketers to develop in-depth buyers’ journey maps and buyer personas, and then leverage these elements to develop targeted messages and strategic content plans. Marketing is therefore armed with the deep buyer insights, messaging, and high quality content required to effectively engage and nurture all personas in an account at each stage of their buying journey. Salesforce Integration to drive more targeted, higher quality Sales interactions: Automatically match each contact in Salesforce to the buyer persona it represents in an account. 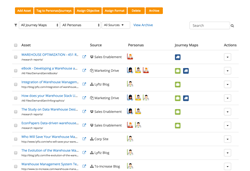 View the detailed journey maps and personas built in Akoonu directly in Salesforce to leverage insights such as the persona’s participation level, needs, barriers, content preferences, and interactions at each stage of their buyers’ journey. Browser plug-in for quick, easy access to buyer insights and mapped content: Access all of the elements developed in Akoonu, including journey maps, buyer personas, targeted messages, and content inventory map, directly from the browser so Marketing can leverage and apply these elements in the context of the tools they’re working in. Content Inventory and Map to more strategically and efficiently plan and use content targeted by persona and journey stage: Via integration with WCM systems, Dropbox, Google Drive, and Box, automatically inventory all content assets from within your website and other disparate systems into one central location in Akoonu. Map each asset to its relevant journey map, buyer persona, journey stage, persona journey stage need, business objective, and content format. Content Coverage Map to ensure a balance of content across personas and journey stages: View a journey map visual for a particular line of business and market segment that shows the number of content ideas, candidates, briefs, and completed assets (for each) by persona and journey stage. From here, view and access the individual ideas, candidates, briefs, and assets. Easily identify where there are over-investments and gaps in content coverage to inform content planning. Share Content Inventory and Map across the organization so content can be successfully used to enable the buyers’ journey: Easily share your content inventory and map via the Akoonu portal to increase access and usage organizationally. Inventory Dashboard to ensure a fresh content library across personas, journey stages, and business objectives: View the number of content assets by persona, journey stage, and business objective, as well as an “aging report” of the assets within each. Akoonu, Inc. ™ is a strategic marketing platform for account-based marketing and selling that empowers B2B marketers to understand how and when to connect with every buyer in an account. Our configurable frameworks, data and systems integrations, and workflows enable B2B marketers to collaboratively develop in-depth journey maps and buyer personas, targeted messaging, and strategic content plans. Our platform activates these elements organizationally so that everyone across Marketing, Sales, Product, and Services can access, leverage, and share them in real-time. As a result, marketers can align internal activities – like content creation, sales enablement, and campaigns – to buyers’ needs and processes. Through this internal alignment and richer understanding of your audience, you’ll execute more targeted marketing and selling that generates high quality leads, engages all buyers in an account, and powers a high quality buying journey. For more information, visit http://www.akoonu.com and follow Akoonu @Akoonu.